Last year, April provided a big rebound from a weak winter in comics sales; this year's winter was strong in comics shops, and its April was better still. Retailers ordered $56.72 million in comic books, graphic novels, and magazines in April, according to Diamond Comic Distributors, beating last October's Diamond Era record by more than $600,000. Last April's sales were up 17% over the same month in 2013, but had the advantage of a fifth shipping week that April 2013 did not have. This April had five shipping weeks so it's an even comparison — and even so, it was up by even more: 17.75%. A lot can be attributed to strength in graphic novel orders, which have been generally softer than sales for comics this year: with a new Walking Dead volume and the Avengers: Rage of Ultron hardcover in the mix graphic novels were up 13.45%. The industry now stands up 12% year-over year. 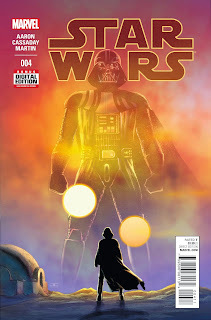 Marvel's Star Wars #4 led the charts; Star Wars titles have taken the #1 slot in the Direct Market comic shops every month this year. (Orphan Black #1 in February topped the charts because of its sales through Loot Crate; there weren't any comics in the April Loot Crate, but it's not clear from the initial lists whether anything in April saw any boosts similar repackagers.) DC's weekly Convergence series had five weeks to work with, and took five slots in the Top 10. Issues of Convergence were returnable, which is what the asterisks in the chart mean. Diamond reduced their reported sales slightly to reflect the possibility of returns, but DC will get credit in the charts at the end of the year for any additional copies sold. Finally, new release volume. Diamond shipped 543 new comic books this April, versus 481 last April. But last October saw even more new releases — 590 comics and 60 additional new graphic novels—and yet this April's topline sales were higher. It's not just how many books are coming out, it's what the books are. The full charts with estimates should be out Monday. John Jackson Miller has tracked the comics industry for more than 20 years, including a decade editing the industry's retail trade magazine; he is the author of several guides to comics, as well as more than a hundred comic books for various franchises. 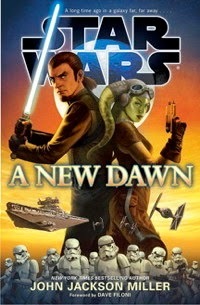 He is the author of several novels including Star Wars: Kenobi, Star Trek: The Next Generation - Takedown, and Star Wars: A New Dawn, now available in paperback. See him next at Star Wars Day, Saturday, June 6 in at the Joliet Public Library in Joliet, Ill.
Visit his fiction site at http://www.farawaypress.com. And be sure to follow Comichron on Twitter and Facebook!